Perhaps it's a result of the so-called paperless office. Or people getting nostalgic about those slot-together paper models you used to get to make as a kid. Or maybe it's just because there's always something satisfying in folding up a bit of paper. Either way, there seems to be lots of designers making fun paper-based products at the moment. Like Robert Czajka. Not content with creating an entire town out of paper, he's now turned his attention to the natural world with his amazing paper animals set. Twenty piece of card to push out and slot together and recreate the magic shown above. 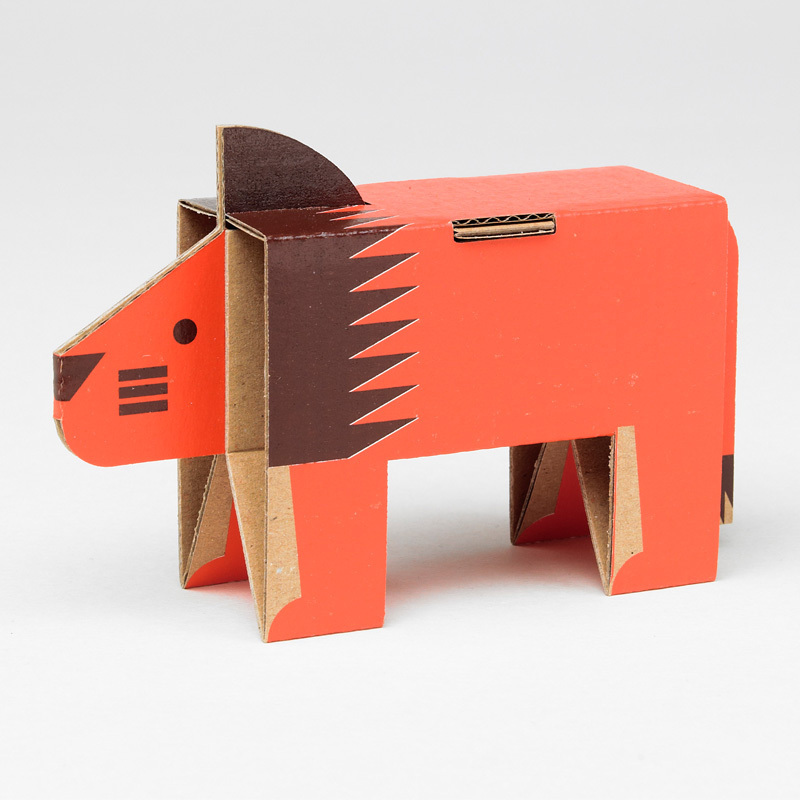 And he's picked some of the very best animals to recreate in angular forms. 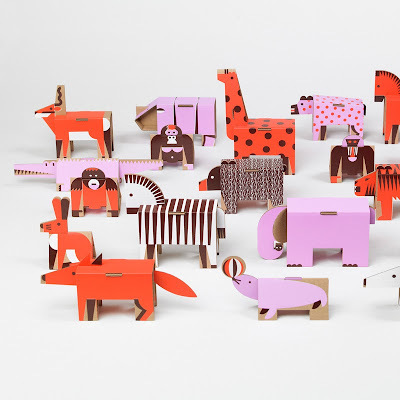 There's a fox, a rabbit, a bear, a gorilla and even a seal, complete with a balancing ball. Here's the, rather timid looking, lion. You can pick up your own set for £22.50 from Theo. 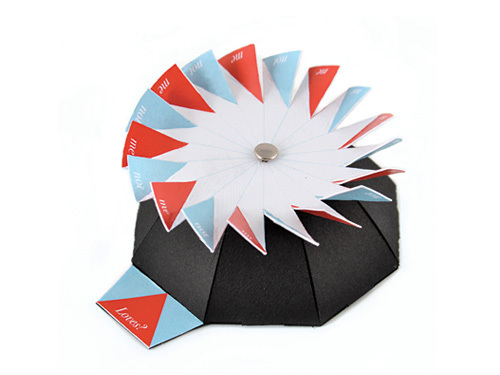 Lollipop Designs are also testing our paper folding skills with their origami notepaper - paper which folds up into wonderful colourful designs. The range includes a fox (foxes seem to be very popular in the paper world) as well as a cat and mouse, and oranges and apples. I picked out the watermelon because I try and make it my philosophy in life to never let a "I carried a watermelon" reference pass me by. A set of ten sheets is £9.50. 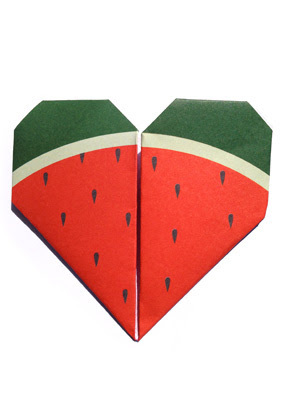 Also worth noting, though not made of paper, are these napkins from Dutch designers Droog which take dinner table origami to a whole new level. Can't be bothered with the faff of finding a daisy to determine important matters of the heart? Simply fold up a cupid consultant instead. Give it a spin and it'll let you know whether they do in fact love you or not. It's something of an arty take on my all-time paper folding favourite, the chatterbox. You can get your own cupid consultant for £4.50 from Another Studio. If your fingers are getting tired from all that creasing and smoothing, why not let someone else do the work for you? 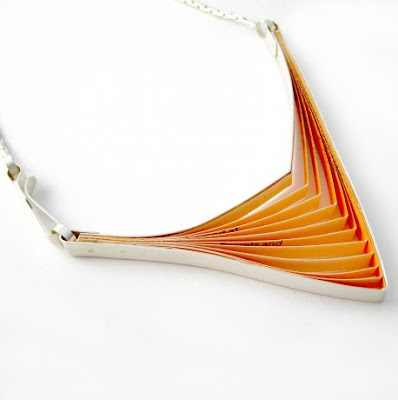 Clara Breen's fine paper jewellery takes paper folding to a new level, as in this orange paper necklace. It's folded paper encased in a silver case. It's very striking, but it's also £160. What on earth happens when it rains?